We’ve found Swiftype to be a goldmine of analytics data—seeing what people are searching for, finding, and not finding. We share these reports with the product team to illuminate user confusion and pain points, and we use the data to add support content and make product changes. Asana is a website and mobile app that helps teams collaborate by putting conversations and tasks together in one place, allowing users to get more done with less effort. 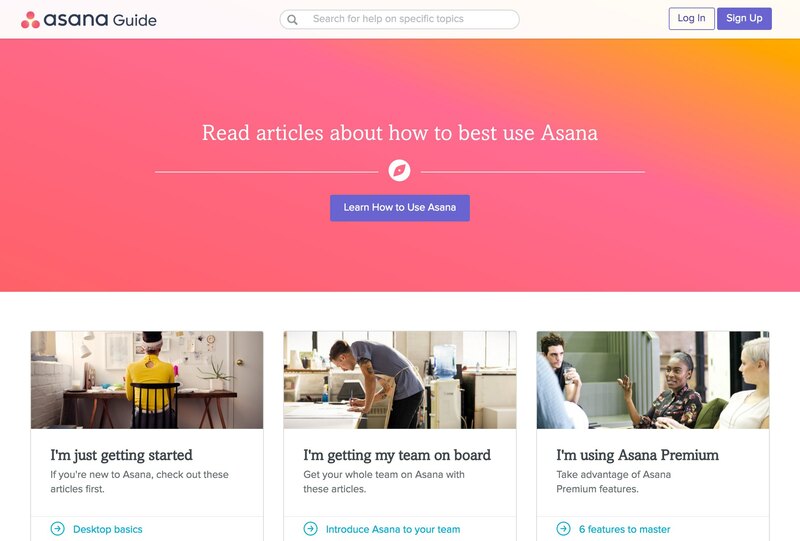 Swiftype powers search for the Asana Guide—a comprehensive support portal that helps Asana users get the most out of the product. They needed strong search and in-depth analytics on customer behavior. Increase case-deflection and decrease your support burden with better search. From the start, Asana prided itself on high-quality customer service, but they wanted to find a way to scale without hiring a massive support team. To make this possible, Asana created an extremely detailed product guide and documentation center—but users were having a hard time searching through all of its content. Ryan uses Swiftype analytics to make sure that users never run into dead ends on their support page. By checking his Swiftype dashboard, Ryan can see the top queries that return no results, prompting him to create content for those user issues or customize search results for those queries through the drag-and-drop results reordering interface—a feature he described as “like magic to me.” Additionally, Asana has gained unexpected intel on their users by looking closely at their top queries, unearthing new ways that customers use their product. In contrast to his experience with Google Analytics, Ryan found the Swiftype dashboard highly accessible and user-friendly—so much so that many members of the operations team receive the weekly search analytics emails. These dashboard analytics and weekly emails serve as a constant reminder of the precise needs of Asana’s users, allowing the team to continually expand their support content and efficiently resolve user issues. SurveyMonkey came to Swiftype for fast, customizable search across their multi-language self-service help center. Shopify needed a powerful search engine to help their users dig through their extensive documentation easily.